It was a warm and sunny day yesterday in Eastbourne - perfect weather to be on the coast, and a great day for our VIP Afternoon Tea event held with Voyages to Antiquity. 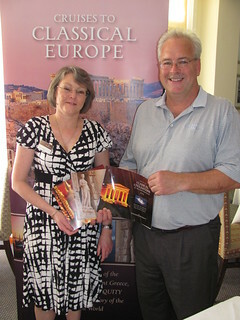 We were at the Langham Hotel, right on the seafront, and welcomed 30 guests to hear a talk and presentation by Clive Howard from Voyages to Antiquity. Jacqui Ridler, our Eastbourne area manager, gave a welcome speech before Clive took to the stage for his presentation about the cruise line and also their ship, Aegean Odyssey, focussing on the great cruise destinations they travel to. Jacqui Ridler said "It was another great event at the Langham. Neil and his staff looked after us ever so well and all our guests enjoyed the talk and presentation by Clive, followed by their afternoon tea of freshly made scones, jam and cream. It was one of our most successful events, with guests taking advantage of special offers and savings"